Housed in our archives collection is a group of scrapbooks lovingly assembled by the All Black legend, John William ‘Billy’ Stead (1877-1958). 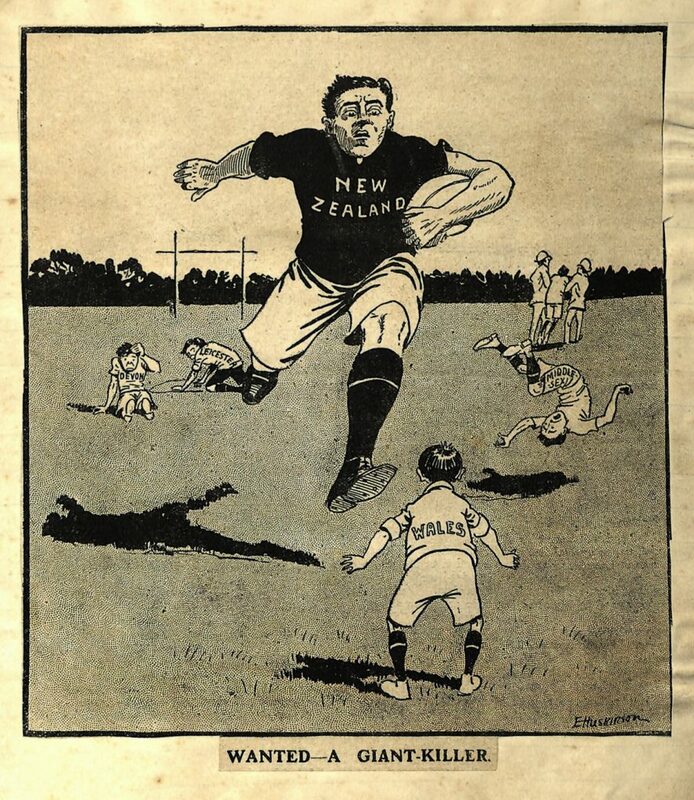 They contain newspaper articles, cartoon clippings, postcards, photographs, telegrams and ephemera which outline his involvement in and passion for all levels of New Zealand rugby. The cover of one of Stead’s scrapbooks (MS-1205/04). The collection contains three more scrapbooks, a folder of victory telegrams and a publication. Scrapbooks can be a rich source of information. Upon opening the cover of a scrapbook a researcher can immediately sense the importance the material held to the compiler. They provide a fantastic record of people’s memories and experiences and as a result offer insight into society at the particular time the material was collated. Stead’s scrapbooks are no exception: they cover his whole career and in the process illustrate rugby’s launch into New Zealand popular culture. Stead was born in Invercargill on 21 September 1877. He started his rugby career in 1896 when he played for the Star Club and was subsequently chosen for the Southland and South Island representative teams. He went on to tour Australia with the New Zealand side, and in 1903 and 1904 captained the team against the visiting British squad. 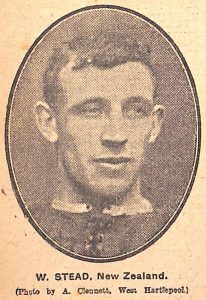 In 1905 Stead was named vice-captain of the Originals on the first official tour of the United Kingdom by a fully representative New Zealand team. This tour saw the side famously win a staggering 31 out of 32 games, scoring 830 points against only 39. The first team photograph of the Originals was taken by a local photographer in Newton Abbot, Devon, before New Zealand’s opening match on tour. The team’s departure in 1905 had been met with little excitement from the New Zealand public but once the Originals began to defeat a personification of the colonial power at their own game and on their own turf, this started to change. Within hours of the photograph being printed, it went on sale as a postcard and subsequently become incredibly popular with the public. Thousands of copies were distributed throughout the country and many were sent with messages back to family and friends in New Zealand. The tour was supposed to have reinforced strong bonds within the British Empire but instead New Zealand was emerging with its own national identity as the home-land of unconquerable heroes. The nation’s character was now defined by the ability to perform amazingly well on foreign soil after travelling for weeks at sea. This showed the Originals were capable of adapting, handling huge pressure and working together as a team. These were relatable qualities to the general population of New Zealand, as displayed a few generations earlier when the first settlers were faced with their own challenges in an unfamiliar land. The only game the side lost was against Wales (0-3) – which happened to be the only game of the tour Stead did not play. However, Stead was not only a talented player, he was also very perceptive and had the ability to turn what he was observing into the written word. Before the team had left New Zealand, the Southland Times asked Stead to write a diary of the tour. 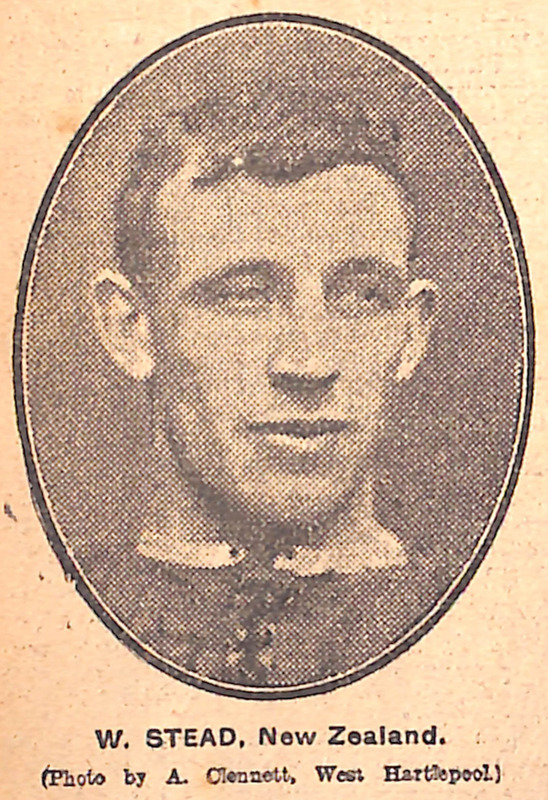 His accounts, titled With the New Zealand Footballers, were predominately about the team’s journey at sea and the experiences of a New Zealander visiting Britain for the first time, as opposed to rugby. He outlined his surroundings and brought the whole experience to life for the average New Zealander. 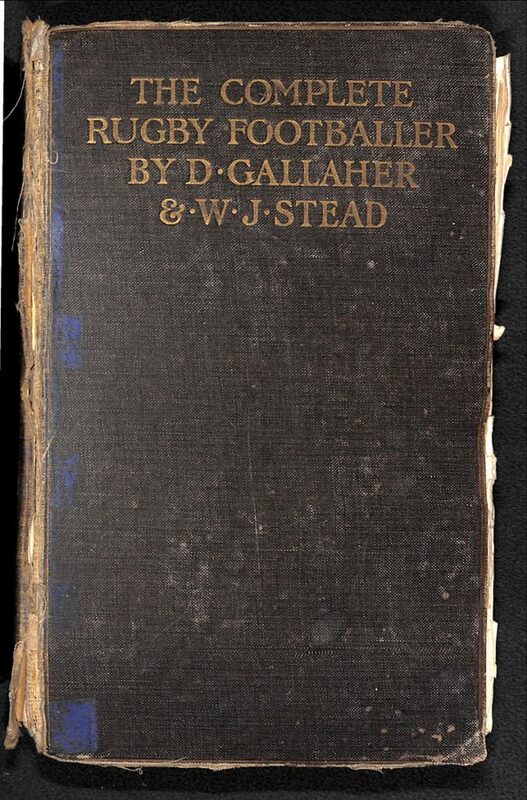 Stead also co-authored one of the classics of rugby book publishing, The complete rugby footballer on the New Zealand system, with Captain Dave Gallaher. It was completed within a very short timeframe but over 322 pages Stead and Gallaher managed to trace the development of rugby in New Zealand. Through text, photographs and diagrams they covered captaincy, coaching, tactics, equipment, training and how they prepared for the tour. Here at Hocken we hold two copies of The complete rugby footballer on the New Zealand system – one in the published collection and one with Stead’s papers. 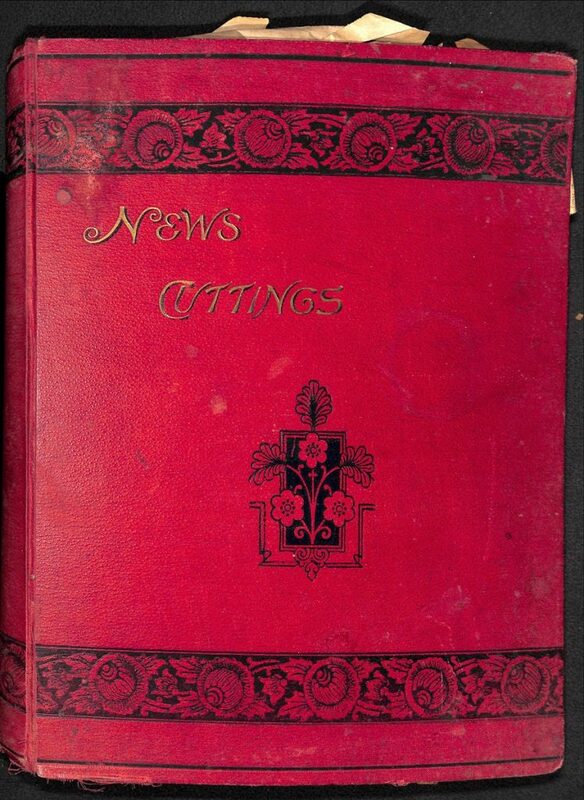 We also hold two compilations of his columns from the Southland Times – With the New Zealand footballers: [excerpts from the columns of the Southland Times concerning the New Zealand Rugby Tour of Great Britain, 1905-1906] and Billy’s trip home: the remarkable diary of an All Black on tour. Due to the success of this tour, the fascination with New Zealand’s triumph and the embodiment of the New Zealand spirit in players such as Stead, rugby became a national passion and obsession throughout New Zealand. For the first time, rugby was entering the realm of literature, widespread newspaper coverage and pictorial representation. As a result, the Originals were projected into popular culture and to this day, New Zealander’s still draw upon this legendary tour as the beginning of our nation’s reputation as unbeatable in the rugby arena. This cartoon was originally printed in The Auckland Weekly News, 8 March, 1906 and features in one of Stead’s scrapbooks (MS-1205/02). 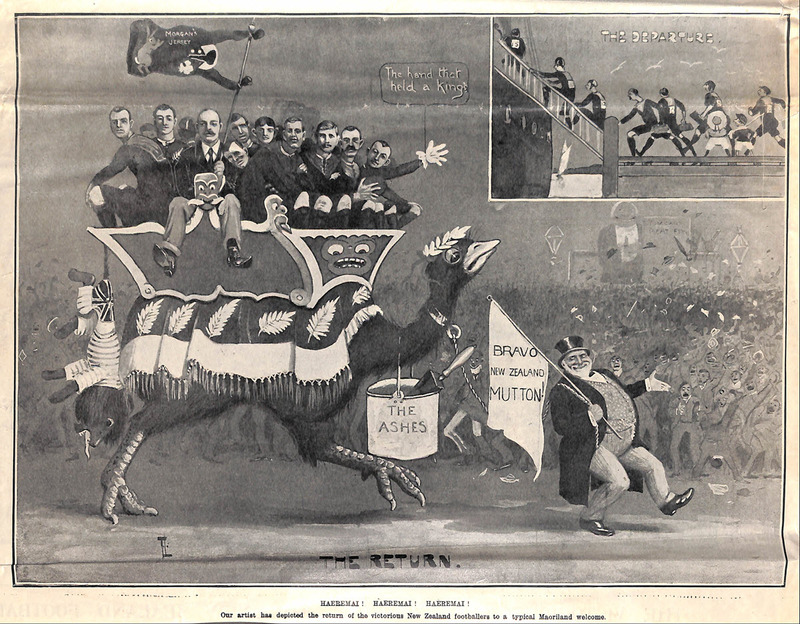 Its caption reads ‘The above picture, which was specially drawn for The Weekly News, conveys some idea of the widespread enthusiasm attending the return of the famous “All Blacks”. The record of the team is really wonderful. 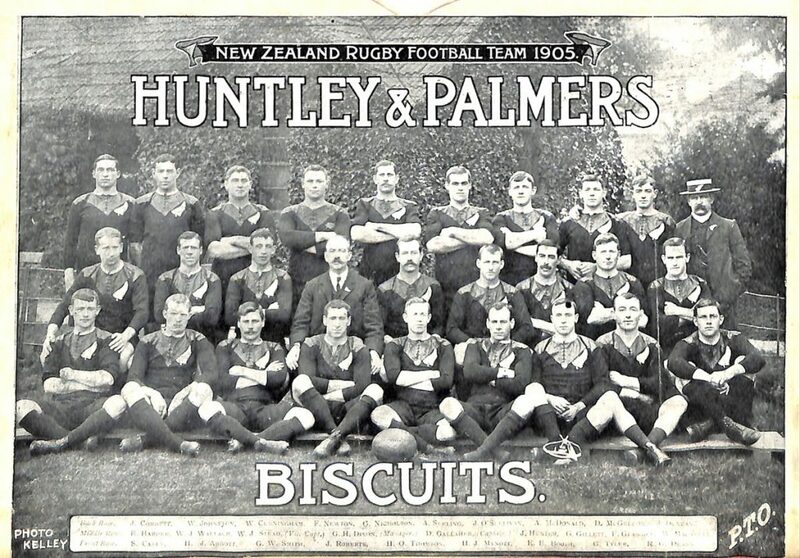 Out of a series of 32 matches, played in Britain, including four internationals, the team was only beaten once and scored 830 points to 39 points scored against.’ The use of the silver fern motif and the team name “All Blacks” were first adopted during this famous tour. This cartoon was originally printed in The Auckland Weekly News, 8 March, 1906 and features in one of Stead’s scrapbooks (MS-1205/02). Its caption reads ‘Haeremai! Haeremai! Haeremai! Our artist had depicted the return of the victorious New Zealand footballers to a typical Maoriland welcome.’ The victorious team are shown riding astride a moa while an English lion bearing the union jack is hung from the rear. Their quiet, nondescript departure is compared with a joyous crowd of celebrators on their return. If you are interested in finding out more about this legendary tour the Hocken publications collection holds a large amount of material pertaining to it and our ephemera collection contains many programmes for All Black matches that continue to reference the Originals’ success years later. We are also home to an additional set of scrapbooks (SER-09625) complied by another All Black, Jack McNab, covering the period 1948-1966 which continue this illustration of All Black supremacy through newspaper clippings and cartoons. The ongoing tradition of international rugby tours can be celebrated this weekend when the All Blacks take on England. At a time when travel is swift and sporting results are communicated around the world instantly, perhaps we can try to imagine how different the experience was for the Originals and for fans back home in 1905. Thomson, Jane. Southern People: A Dictionary of Otago Southland Biography. Dunedin, N.Z: Longacre Press in association with the Dunedin City Council, 1998. Stead, W. J. Billy’s trip home: the remarkable diary of an All Black on tour. Dunedin N.Z. : New Zealand Sports Hall of Fame, 2005. Howitt, Bob and Dianne Haworth. 1905 Originals: the remarkable story of the team that went away as the Colonials and came back as the All Blacks. Auckland, N.Z. : HarperSports, 2005. Ryan, Greg. 1905, legend and legacy. Christchurch, N.Z. : Canterbury History Foundation, 2005. Tobin, Christopher. 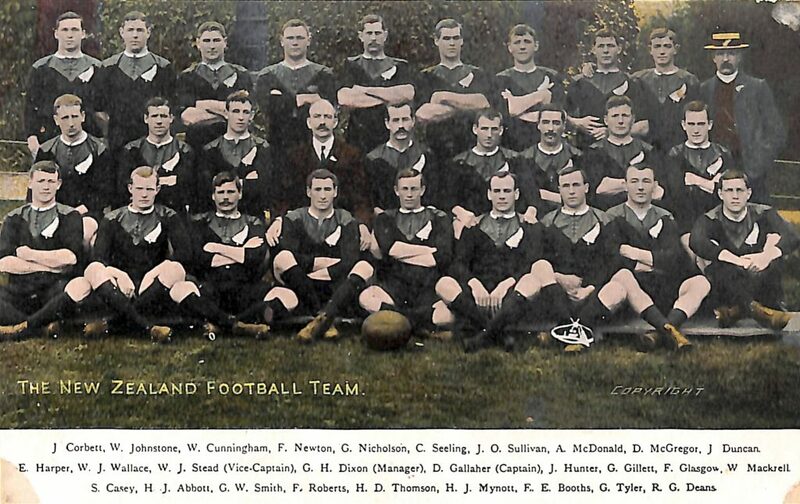 The original All Blacks: 1905-06. Auckland, N.Z. : Hodder Moa Beckett, 2005. What do Sir Peter Buck, Chris Laidlaw, Vic Cavanagh and Greg McGee have in common? Yes – rubgy for one but you’ll have to visit the Hocken Library find out the full answer! In collaboration with Hidden Dunedin, and the University’s Design Studies Department the Hocken has put on a display that examines the contributions made by Otago people to the development of rugby by showcasing a sample of this rich history. Drawn from the Hocken’s own collections, the show features rugby memorabilia, early rugby publications, official team photographs and personal scrapbooks. A version of the display will also be installed from 17 September in The Link next to the Central Library of the University. 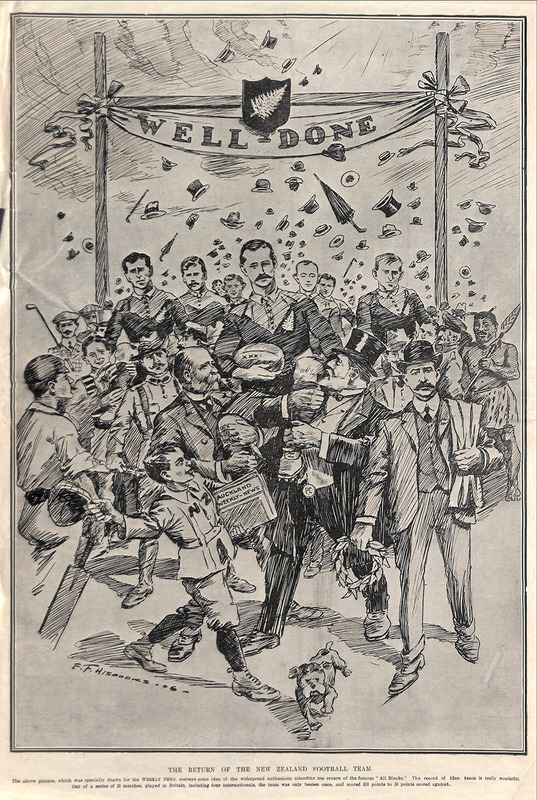 Tom Ellison’s The Art of Rugby Football (1902). Ellison is known as one of the game’s great innovators and was introduced to rugby by his Taiaroa cousins at Otakou around 1881. He was a prominent member of the New Zealand Native Football Team, which toured Great Britain and Australia in 1888 and captained the 1893 New Zealand team on their tour of Australia. It was his suggestion that the New Zealand team should adopt Native team uniform of the black jerseys with a silver ferns. The 2-3-2 scrum formation that he developed for his Poneke club team in Wellington became the dominant style of All Black play until the 1930s. Billy Stead had an enduring influence on Maori and All Black rugby. Stead was a member of the first official New Zealand tour of Britain and France in 1905-06. He was the team’s vice-captain and chief tactician. He wrote regular columns for the Southland Times and at the end of the tour, combined with captain David Gallaher to write one of the earliest rugby classics, The Complete Rugby Footballer. He played 32 games for the All Blacks, 12 as captain, he was part of the first Maori team and was later a referee, coach and manager. On display are a photo of the team, victory telegrams, and a copy of his book. Ned Parata, from Puketeraki, Karitane, is widely regarded as the father of Maori rugby. The parallel development of Māori rugby was one of the defining characteristics of New Zealand rugby. Wiremu Teihoka (Ned) Parata organised the first Māori team in 1910 and persuaded Billy Stead to come out of retirement to play for it. Parata, who underwrote the cost of touring from the profits of his motor car business, continued to organise Māori rugby for the next 20 years, climaxing in the 40-match tour of Europe and Canada over the summer of 1926-27. An visual display features a selection of images from his scrapbook; it contains photographs, letters and newspaper clippings relating to the tour. J W Stewart’s album features the celebrated Maori rugby tour of France, Britain and Canada led by Ned Parata and contains photographs, newspaper clippings and ephemera relating to the New Zealand Maori rugby tour of Great Britain, France and Canada, 1926-1927. It also has photographs of Palmerston, North Otago and South Island Maori teams. J. Stewart appears in many of these photographs and has been attributed as the creator of the album. Still wondering the answer to the question at the start of this post? A hint is that the display contains a selection of team photos from the Otago University Rugby Football teams over the years. To hear Dunedin sports historian Ron Palenski on Otago and the ruck listen to this interview with Jim Moira. To see some of the display content and hear yours truely on my favourite items watch this clip from Channel 9. The exhibition team comprised Dr. Noel Waite, Senior Lecturer; Michael Findlay, Professional Practice Fellow; Ryan Gallagher and Jon Thom, students, all of the Department of Applied Sciences and Sharon Dell, Hocken Librarian, working with Mark Sharma, Studio 3, Dunedin and Ron Palenski, external advisor, NZ Sports Hall of Fame, Dunedin.